David Zwirner is pleased to present an exhibition of portraits and still lifes by Alice Neel, on view at the gallery’s 533 West 19th Street space. This is the second solo exhibition of Neel’s work since David Zwirner started representing her Estate in 2008. 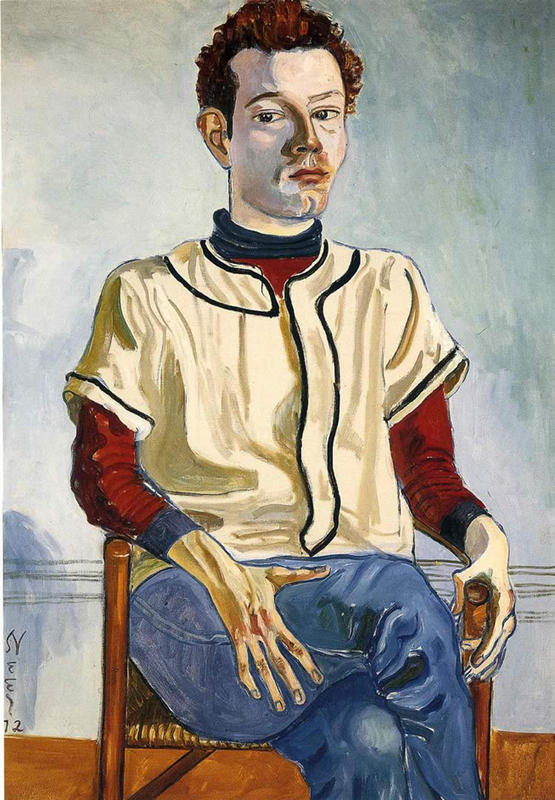 With a practice spanning the 1920s to the 1980s, Alice Neel (1900- 1984) is widely regarded as one of the greatest figurative painters of the twentieth century. Based in New York City, Neel chose her subjects from her family, friends, and a broad variety of locals: writers, poets, artists, students, textile salesmen, psychologists, cabaret singers, and homeless bohemians. Her eccentric selection was thus also a portrayal of, and dialogue with, the city in which she lived. Through her forthright and at times humorous touch, her work engaged with ongoing political and social issues, including gender, racial inequality, and labor struggles. Neel’s works are characterized by a poised, fluid handling of paint, which combines precise attention to detail with abstract or sketch-like strokes. Her compositions frame her subjects centrally while retaining a sense of autonomy, which in turn broadens the focus of the portrait beyond the face of the sitters to the rest of the canvas. Neel’s practice was remarkably impervious to the fluctuating artistic movements it witnessed, and she famously reaffirmed her commitment to the human body at a time when her avant-garde contemporaries were denouncing figuration. A stylistic development is nonetheless apparent in her paintings from the 1960s onwards. Coinciding with a growing reputation in the art world, where she had thus far only remained on the margins, Neel’s work grew brighter and more experimental during this decade, and increasingly explored the medium of paint for its expressive qualities. This exhibition includes portraits and still lifes made between 1964 and 1983, the last two decades of Neel’s life. The portraits affirm the shift in her work towards more luminous compositions, as witnessed for example in Abe’s Grandchildren (1964) and Richard (1969), where the background is partially rendered and supplanted by abstract areas of paint. Likewise, in the still lifes—a genre Neel continued to address throughout her career—such changes are evident in the arbitrary use of perspective and the artist’s bright palette. In Still Life (Breakfast Table) (1965), a bird’s eye view of a strident yellow table is set off by many of the objects on its surface, which are shown from their sides, and in Light (1980), a shadow cast by a sun-lit table omits the flowers arranged on its source. In other still lifes, potted plants and cut flowers take on anthropomorphic presences, and even hint at a subtle version of self-portraiture. Aside from two paintings made in her family home in New Jersey, and a portrait from San Francisco, all of the works in the show were painted in New York. The exhibition is accompanied by a fully illustrated catalogue co-published by Radius Books, featuring an essay by Tim Griffin, Executive Director and Chief Curator at The Kitchen, New York, and former Artforum editor. Alice Neel was born in 1900 in Merion Square, Pennsylvania, and died in 1984 in New York. She had her first retrospective at the Whitney Museum of American Art, New York, in 1974, and the Whitney mounted another solo exhibition of her work in 2000, which traveled to the Addison Gallery of American Art at Phillips Academy, Andover, Massachusetts; Philadelphia Museum of Art; Walker Art Center, Minneapolis, Minnesota; and the Denver Art Museum, Colorado. Since 2008, The Estate of Alice Neel has been represented by David Zwirner, New York, where her work was presented in 2009 in a critically acclaimed, two-venue solo exhibition, Alice Neel: Selected Works and Alice Neel: Nudes of the 1930s (on view at Zwirner & Wirth, New York). In 2010, the Museum of Fine Arts, Houston in Texas organized a major survey, Alice Neel: Painted Truths, which traveled to Whitechapel Gallery, London, and Moderna Museet Malmö, Sweden. Her work was recently on view in a solo exhibition in 2011 at the Douglas Hyde Gallery, which formed part of the Dublin Contemporary 2011, Terrible Beauty – Art, Crisis, Change & The Office of Non-Compliance. Work by the artist is represented in major museum collections, including The Art Institute of Chicago; Fine Arts Museums of San Francisco; Hirshhorn Museum and Sculpture Garden, Washington, D.C.; The Metropolitan Museum of Art, New York; Moderna Museet, Stockholm; Museum of Contemporary Art, Los Angeles; The Museum of Fine Arts, Boston; Museum of Fine Arts, Houston, Texas; The Museum of Modern Art, New York; National Gallery of Art, Washington, D.C.; Philadelphia Museum of Art; Tate, London; Wadsworth Atheneum Museum of Art, Hartford, Connecticut; Whitney Museum of American Art, New York; Worcester Art Museum, Massachusetts; Yale University Art Gallery, New Haven, Connecticut; among others.